Heidi and Patrick Behan clearly know a thing or two about growing great apples. The Cobourg-area apple farmers have won the Ontario Apple Grower trophy for commercial production at the Royal Agricultural Winter Fair’s apple competition not just once, but three times in recent years. The Behans have been entering the competition, which is open to apple growers from across Canada, since 2008 when it was brought back to the Royal Winter Fair after a hiatus of more than 40 years, and have won the commercial production title in 2008, 2010 and 2011. They didn’t participate in 2012 when early spring frosts devastated their orchard and left them without a crop. There are different categories in the competition, including commercial, new and heritage varieties, and growers can enter apples they’ve grown into the appropriate categories. Commercial varieties includes those commonly found in grocery stores, such as McIntosh, Empire or Spartan; the heritage categories focuses on varieties that are no longer widely grown, like Russett or Gravenstein; and the new category is open to apples such as Honey Crisp, Ambrosia or Aurora, newer arrivals on the apple scene. Participants enter a setting or group of a particular apple variety into a category, which are then judged according to a set of criteria. Competitors accumulate points for each apple variety to win an individual category and winners receive plaques and ribbons. The name of the winner of the commercial variety category is engraved on a trophy that is on display permanently at the Royal. The Behans grow 22 varieties of apples in their 25-acre orchard and have been farming since 2002 when they purchased the operation from Heidi’s parents, Ivan and Eleanor Moore, who still live next door. Their major apple varieties are McIntosh, Gala, Honey Crisp, Empire, Spartan, and Crispin, which they sell through their on-farm market, at the Cobourg Farmers’ Market and to a local apple packer. They also sell apples, as well as their well-known apple cider, into several local chain grocery stores in Cobourg and Port Hope. 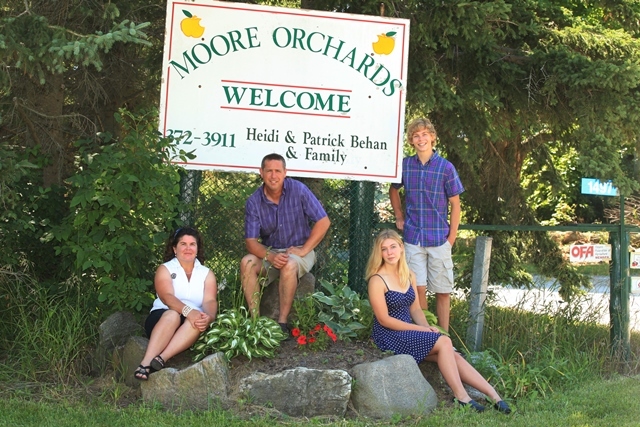 Although they’re not sure yet whether either of their children – their daughter is in grade 12 and their son in grade 10 – is interested in taking over the business someday, the Behans are actively renewing their orchard every year by taking out rows of older trees and replacing them with newer varieties. And as another Royal Winter Fair approaches, Heidi and Patrick are busy selecting their entries for this year’s competition. Results will be posted at www.royalfair.org. Story by Lilian Schaer, photo courtesy of the Behan family.